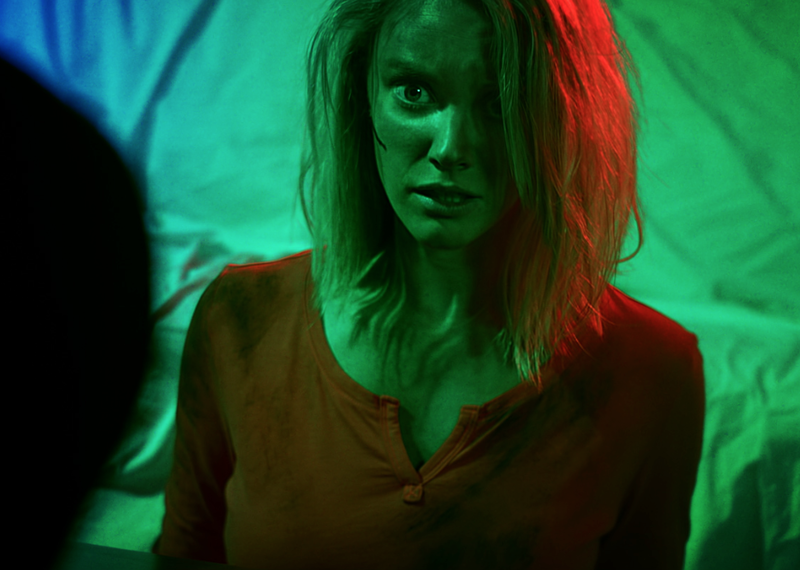 Writer-director Torey Haas vividly captures the campy, often excessive, spirit of playful exuberance that fueled the 1980’s with his full-length feature debut, The Neon Dead (2015). Distributed through Wild Eye Releasing and produced through MonsterBuster Entertainment, Haas has crafted a briskly paced, 80 minute delight. This is an unassuming and consistently engaging gem. It is one which incorporates many of the most memorable cinematic attributes of the previously stated bygone decade. The most notable of this is the often impressive, frequently cartoonish, but always enjoyable effects. They run the gambit of different brands of graphic illusions. This is with a range echoing from more practical designs to computer generated imagery. This comes courtesy of Tricia Gaulesky, Lane Force, Fred Grant and the long proven maestro of such visual components himself, Haas. What is just as triumphant: there is a wonderful balance continuously drawn throughout the exertion. It alternates between deliberately tongue in cheek, and mostly inoffensive, humor and largely same said horror. Such an ambiance impeccably parallels VHS classics like Sam Raimi’s masterpiece, The Evil Dead 2 (1987). John Carpenter’s alien invasion opus, They Live (1988), Dan O’ Bannon’s schlock tour de force, Return of the Living Dead (1985), Stephen Chiodo’s laughter fueled cult model, Killer Klowns From Outer Space (1988), and Stuart Gordon’s magnificent H.P. Lovecraft adaptation, The Re-Animator (1985), also come to mind. There are also touches heavily reminiscent of bigger budgeted pictures. For instance, mirrors to Ivan Reitman’s ground-breaking Ghostbusters (1984) and Tobe Hooper’s Poltergeist (1982) are reflected throughout the fiction. Nick Lauinger emphasizes Haas’ obvious inspiration. This is with cinematography that is every bit as flashy, colorful and bright as the popular accessories, clothing, music videos and cinema that were so prevalent in the last five years of the 80’s. Similarly, Hsiang-Mieng Wen utilizes heavily rock influenced music. These arrangements fit each segment fabulously. Eric Davis, Katelyn Brammer, Nick Amideo and Haas provide editing that is proficient. Much in the manner of most of the aforementioned accomplishments, these elements are all a brilliant match for the mood of the piece. The charming characterizations, though intentional stereotypes, can also be taken from various genre appropriate entries from thirty years ago. They are just as suitably cut for any number of John Hughes’ teen angst comedies. Adding to this antiquated appeal is that there is even an amusing battle at about an hour in. It plays like a pleasantly constructed, micro-budget rendition of the light saber battle between Luke Skywalker (Mark Hamill) and Darth Vader (David Prowse). This transpired near the iconic finale of The Empire Strikes Back (1980). If you are like me, and have a soft spot in your heart for any or all of these endearing gems, you will absolutely adore The Neon Dead. Haas tells the tale of a Fairview State University graduate by the name of Allison Hillstead (in an ever-likable performance by Marie Barker). She is searching for a job. After being invited to an interview at noon that day for an assistant manager position at Saucy Jack’s, for which she boldly promises to be there a half hour prior, her immediate future seems certainly promising. That is until an undead woman is spied brushing her blood red hair, much of which comes off with her scalp, in the bathroom of Allison’s household. Fear soon gets the best of her. Trepidation turns to impatience. Such occurs as this otherwise horrifying moment is interrupted by a young Wilderness Scout of America, Ashley Amberson (in a wonderful turn from Josie Levy). Insisting on staying until she can receive a donation from Allison, Ashley unveils Allison’s worried plight. This is when she is informed of, and eventually contacts, a pair of paranormal investigators. These are Desmond (in a winning portrayal by Greg Garrison), a slacker/boy next door type, and the bookish Jake (in a depiction by Dylan Schettina that matches Garrison’s representation in quality and amiability). They are employed at a video rental department inside a local Save More grocery store. After this, Allison and Ashley head back upstairs to see what the so called “zombie” is up to. That is when Desmond and Jake, who quickly abandon their behind the register positions, arrive at Allison’s residence. From herein, the situation turns to an otherworldly battle. This is among the leader of the takeover, Guysmiley, the demonic “sons of Z’athax” and our iodized salt armed band of intrepid human heroes. The result is an absolute joy for B-movie fans. This is an endlessly, uproariously fun, and never overly graphic (though you may think you have seen more gore than you actually have), experience. Though it is structured conventionally, the economically priced epic can easily be dubbed: “a non-stop the rollercoaster ride”. This certainly mechanizes spectacularly to the favor of the film. This is also thanks to ardent, commanding direction from Haas. The screenplay he erected for this $17,000 budgeted affair avoids the pretention, self-awareness, tired gimmicks and dead seriousness common in modern fare. In turn, we are awarded a plethora of successfully clever jokes. There is also plenty of equally victorious flashes of spirited dread. A concluding scene, which revolves around the “life goes on” ideology, is especially humorous. The dialogue, though familiar, is smartly written and delivered. There is also just enough exposition to be satisfactory. This is without weighing down the general story arc and movement of events. Likewise, such an aspect keeps our leads relatable to a large net of onlookers. Though the undertaking never aims to be outright terrifying, many of the early shots of the creatures veiled in the shadows, their eyes glowing voraciously in the background, are genuinely effective. But, what is best of all is that Haas doesn’t rely solely on the herculean sense of past longings ever-present within the framework of his narrative. He has a wild array of ideas in store. This he executes with feverish gusto and glee. Furthermore, Haas bucks the long-exhausted traditions and standard expectations of the returning corpse genus at every turn. A running gag concerning who the unholy entities really are can be seen as another sly wink at Haas’ audience in that respect. Comparatively, there is also an extended incidence involving a talking, decapitated head. This portion further proves the fusion of smiles and inventiveness at hand. It all enhances the nostalgia. This is as it evokes fond recollections of a similar manifestation unveiled in the final half of Ridley Scott’s Alien (1979). Though Haas keeps his antagonists limited in number, there are a multitude of smaller roles which make a comparably abundant impression. John Reed as Big Z, Andrew Puckett as Drake Hillstead and Candace Mabry as Belle are all terrific. The other technical angles are just as accomplished. Breanna Thompson’s set decoration and Sean Michael Patton’s costume design beautifully retain the everyday details and cheery aesthetic of the piece. The make-up department, composed of Gaulesky, Jeremy Ledbetter, Christine Nguyen and Kate Northcutt, is both natural and radiant. Haas’ animation and Quyen Tran’s sound are just as awe-inspiring. Brian Hardison and John Holbrook issue masterful art division work. Hardison completes the illusion of stepping into the 80’s with a poster that is as ingenious, fluorescent and eye-catching as the fiendish specters who inhabit the movie itself. This is pure escapist entertainment. It endures as one of the best “throwback” love letters in recent recollection. Haas showcases a wide knowledge of the era he is sending up. This is from the deceptively low-key opening. Such a sensation endures throughout the presentation. Moreover, the climax is solid. It is also, refreshingly, anything but overblown. Haas even gives us a pleasant bit of information in a post-credits scene that is sure to make your expectations for what is on the horizon blossom. It is also guaranteed to make your overall admiration for the endeavor all the grander. The brief duration also helps. We leave the photoplay wanting more. This is while admiring the noticeable lack of fat on the celluloid bones of the flick. These are all wise decisions. They all come together to celebrate Haas’ talent, the great new feature he has woven and a period often described as “the neon decade” with precision and heart. Haas has also unquestionably proven that there is still plenty of life left in the often autonomous subject of the recently resurrected. This is the type of offering those of us who often haunted local video stores as often as possible and spent untold hours studying scarce titles often dream about making a comeback. The Neon Dead is reminiscence inducing, independent art. It is the type of moving fabrication you will gladly feel compelled to return to again and again. This is as the years move on and a longing for old-fashioned comforts begins to settle once more into your bones. Such is the definition of an instant classic!